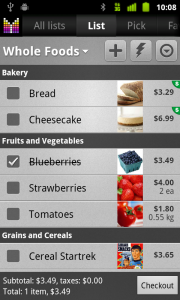 Current shopping list is a key activity of Mighty Grocery. 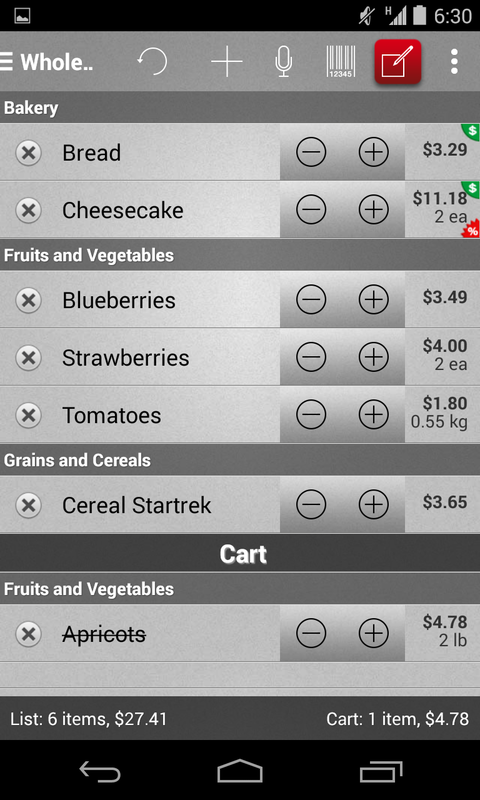 Typical usage scenario includes adding items, placing items in cart, checking out. It is also possible to open Item Details and change quantity and price. Please make sure to see Getting Started Guide before moving on. Click Add button (Plus) on top of Shopping list screen. The app shows a list of existing items from product catalog which match your entry. Click on an item to add it to the shopping list. If item does not exist on product catalog, just continue typing to enter the full item name and click Add button. To activate Edit mode tap Lightning button. Tap the icon again to deactivate Edit mode. 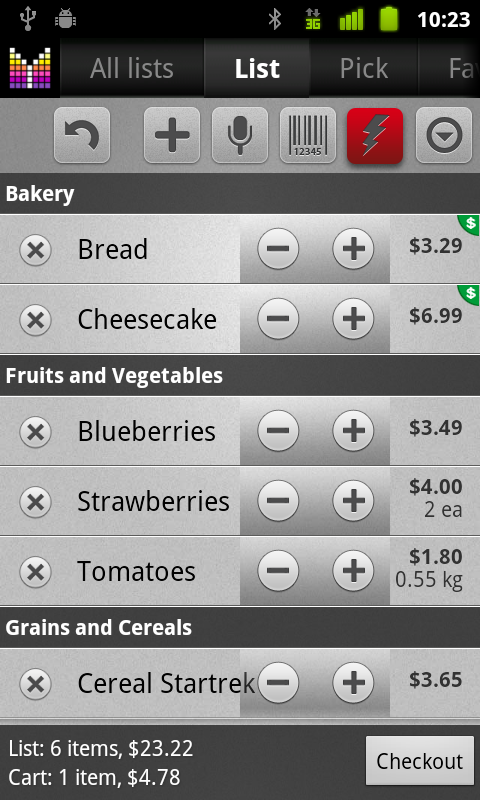 In Edit mode you can quickly add items using Voice and Barcode scan. Also, you can change order of items using drag-drop if “Sort by name” option is OFF under Menu > Settings > Options > Sort options. Just touch and hold a record on the right side and drag it up or down to the place you want. To edit an item, e.g. set item price, quantity, etc. tap on the right side of a row to open Edit item screen. Long-tap item to bring up a context menu. The item is hidden from the list. Postponed items will be placed on shopping list again. You can use Sort and filter command in Side Menu to show All / Current or Postponed only. By default, items are grouped by aisles and are not sorted by name so you could reorder items manually. Default sort options are specified under Menu > Settings > Options > Sort options. If you would like to change default sort options, tap Side menu > Sort and filter > uncheck Use default sort options. 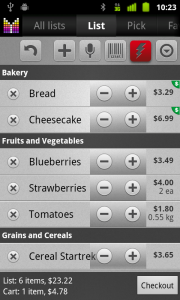 Open Edit Item screen by clicking on the right of an item in shopping list. Select shopping list you would like to move item to. The item is moved to a different shopping list. In order to assign items to multiple stores it will require a Master list, say “Groceries”, and a few sub-lists which would represent your stores, say “Whole Foods” and “Costco”. If you assign an item to Groceries, it will be listed under Groceries, Whole Foods and Costco. If you assign item directly to a store’s list, it will be listed under that store and under Master list e.g. Groceries. Please see Manage shopping lists User’s Guide for more details on how to get your Master list configured. I wish the “add item” using Voice would only add an item if matches an item already in the user configured product catalog. If an item doesn’t exist, the normal add item command could automatically be initiated: That way you would have a chance to manually edit a new item before it is added. Hi Oliver, thanks for your suggestions. We will consider these improvements going forward. Hi! Is there a way to reorder items in an aisle? And is there a way to reorder aisle manually? Thanks for your App! Can’t wait to get Windows version! Thanks for your questions. Yes, both things are possible. To reorder aisles, please go to Aisles tab and switch to Edit mode. More details in Manage Aisles User’s Guide. 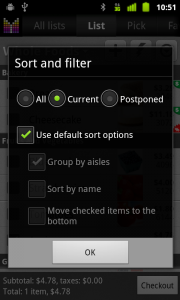 To change order of items within aisle: 1) turn off Sort by name under Menu > Settings > Options > Sort options; 2) switch to Edit mode in any list. Unfortunately, we don’t have plans for Windows version. Currently we are working on iOS version. Recently, when I check off an item on a shopping list, a window pops up asking me to enter a Unit Price. How can I stop this from happening? Is extremely annoying. Wilfred, to disable Unit Price prompt you could tap in the middle of a row (not checkbox) or disable “Details mode” under Menu > Settings > Options. It seems that anytime I enter more than 15 items on a shopping list, the additional items do not appear under the correct aisle category. For example, red peppers appeared under Meats instead of Produce on this week’s list. Last week Sirloin Tip appeared under Produce instead of Meats. How can I correct this? Or is there a 15 item limit for shipping lists? Gary, no, there is no item limit in shopping list. Most likely this has something to do with your aisle configuration. Please contact us at hi@mightypocket.com so we could help you further. Hi, I’ve been using the paid App for some while now and shop for someone who can’t get out to do her own. It’s just “so” useful for her to enter her shopping on the MG website over the week so it’s readily available on my Galaxy when I get to the store. However, over time we have both made spelling mistakes or duplicate entries. For example: Baked beans, Baked Beans. How do I permanently remove the items I no longer want from the database? Geoff, thanks for your feedback. You can modify your product catalog under Menu > Settings > Pick list. Just find the records you don’t need, long-tap, then Delete. There isn’t a plus sign or a lightening sign, in the top right corner of my shopping lists, it use to be there, but something happened and I can’t get them back. I tried sliding the item in the corner but they aren’t there. ? ? ? Sharon, try opening side bar in your shopping list, then long-tap plus button and lightning button to move buttons back on top. Yes, it is possible to enter different prices per store. Please have a look at the List-specific Favorites. I noticed that when I add items to a shopping list, some of the items have a yellow triangle at the upper left hand corner. What does it signify? The yellow triangle means that something is entered in item’s Comments field. Hello! I was wondering if there was a way to move an entire list from one store to another? I use my lists for comparison shopping and if I end up going to a different store then I find myself moving all items individually. Molly, thank you for your question. Unfortunately, there is no way to move multiple items between lists. We plan to add this feature in the future. In the meantime you may want to use Super-list feature, add items to your Super-list and then shop under sub-lists. For more details please see Super-lists User’s Guide. Is there a way to customize a list by deleting certain fields? For example, I want to delete or hide the quantity and unit fields in a list. Can I do this? Unfortunately, such customization is not available. But you may want to consider using ToDo lists if you don’t need shopping fields for your items.